this is my way of sorting colors before I begin work. The center holds the bobbins. 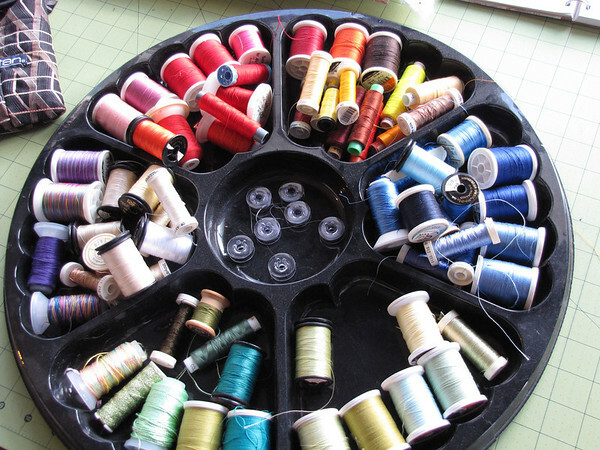 Each day consists of 8 bobbins–which is one 250 yard spool of thread. Last fall before my scheduled back surgery I was notified that I had been juried into a SAQA silver anniversary show. I don’t know how many artists applied but I was definitely surprised. Unfortunately I had to put the project on hold while I recovered, being limited to sitting no more than twenty minutes, standing no more than ten, and mostly lying down with no excitement. Along the way I bought a bag of scraps on Ebay which had promised to be feedsack remnants. Unfortunately they were not but they had a lovely golden tone and so I diligently pieced together the small pieces into Mulligan blocks–crumb blocks–mile a minute–they go by a lot of different names. The background was completed by the middle of December and I only needed to find photographs to fit my purpose. I take a lot of photographs, many are used for poses and expressions and activities and not always the best photographs. Some of my photographs are quite nice and I differentiate those from my working files. My idea was to illustrate the concentration and joy of playing with liquid mercury as some of us did as children–when the thermometer broke. Mercury is also known as quicksilver. I looked through some of my photos, took some, and printed them not realizing my printer had been out of black ink for some time–cartridge wasn’t even in there–so the images were mostly red and blue with a lot of lines through them. Next step is to enlarge them to the proper size and I seem to have to relearn that faces the size of my thumbnail are not easy to execute. Next came the drawings of all the figures, the selection of fabrics and the hand applique of all the pieces in place. I don’t like fusible–I ran out one weekend, didn’t have a car (for some reason) and decided to try it without. Needle-turning the edges came after I decided I did not like the tiny thread sticking out from the raw edges of the pieces. At last I was ready to do the imagery, a step that I always approach with hesitation–and of course the first one was the hardest one–the thumbnail face–as it was behind a larger face. Back to the store twice for more bobbin thread–I use coats and Clark Dual duty Polyester in a medium gray color. The sides seemed to be ruffling despite an initial overall gridding in silver. I added a second gridding in a variegated black-silver-white. Still ruffling. Off to the fabric store for some interfacing. Plopped the piece down on the living room floor and ironed the interfacing on the back. :Pinned the backing and outlined the figures in black. Cut a binding from black. And took its picture with the aid of photo lights and work lights. Imagery sent off one day early! Unfortunately I cannot show you the completed piece. You will have to come to International Quilt Festival Houston in fall of 2014. Completion feels like I have run a marathon—but I need to start training for the next one.